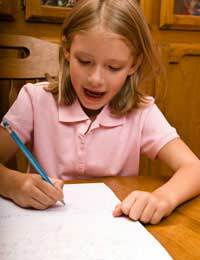 Lots of children find spelling and grammar hard and this can decrease the pleasure that they derive from writing. Reading, writing, spelling and grammar are all interrelated and are taught as an integrated part of the Key Stage 1 literacy program. Most children need direct spelling instruction. When children first begin to deal with letter-sound associations they use a process called ‘invented spelling’. This is when they use their letter-sound knowledge to try to spell a word when the correct spelling is not known. This can be very useful for a time, but as their learning progresses they must also be taught to spell words correctly. Grammar is the set of rules that governs a language or a set of guidelines that explains how a language works. Grammar is essential for clear communication and is what gives sense to a language. Your child will be learning grammar usage such as parts of speech, punctuation rules etc. Writing, spelling and grammar are closely connected and are all taught in relation to each other and to reading. The first grammar your child will learn is by example. Sentence structure, pronoun use and verb use are all learnt through hearing people speaking correctly. However, if poor speech is modelled, this is what your child will learn. Grammar is mainly learnt through observation and through personal reading. Encourage your child to pay attention to the spelling of words as they read. Provide your child with a simple children’s dictionary and get your child to look up unfamiliar words as they come across them. Make it in to a game for your child, such as forming anagrams out of their name or other common words. Encourage your child to always proofread their work for spelling and grammar mistakes. When using a computer the spell checker can be very useful but they is still no substitute for human proofreading. Language arts songs that teach grammar, punctuation and spelling can be found on the Internet. Many of these can be listened to online or you can purchase the download or CD. Give your child old newspapers or magazines to play word-finding games. These games can be made harder as your child’s learning progresses. There are many free English spelling and grammar teaching tools online. No matter what age or level your child is, you should be able to find suitable tutorials, worksheets and fun activities that you can do with your child to reinforce what they are learning in school. Always read over your child’s homework when they are finished and point out spelling and grammar mistakes as you find them. Discuss what was wrong, what it should have been, and why. The more time your child dedicates to reading the more their spelling and grammar will improve, and the more they see the correct forms modelled for them, the better they will be able to remember how it is supposed to look when they try to write for themselves.